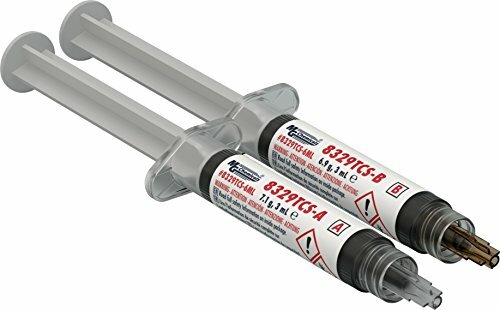 The 8329TCS Slow Cure Thermal Conductive Adhesive is an electronically insulating epoxy that combines long working time and high thermal conductivity with ease of use. Used for thermal management situations requiring superior bonding strengths and good thermal transfers. For example, it is used to as a die-attach for electrical and electronics, increasing their long term reliability. It is great for heat sink bonding. It is also used as a high-powered LED adhesive that maximizes the lifetime of LEDs by dissipating their heat. It has a convenient 1-to-1 mix ratio and 4 hours pot life. Due to this long pot life, the mixed adhesive essentially behaves like a 1-part adhesive for the duration of a work shift. However, unlike 1-part adhesives, it doesn’t require temperatures as high as 130°C and 170 °C (266°F and 338°F) to cure, and it will cure at a more moderate 80°C (176°F) in less than 1 hour. The cured adhesive bonds very well to most substrates used in electronic assemblies; and resists thermal and mechanical shocks.